Definitely a great book for builders, Kirsten! I love them apples! (and worms :-)) Great trailer! You picked another good one, Julie! Lowly Worm (Scarry) has some serious popularity competition, Iza. Macintosh are my faves for a nice Apfelkuchen recipe, Giny, but don’t tell that to the mc! Wonderful! Don’t enter me I’m too far. I’ll pick it up from the library. You are too far for me to stop by, but I still have high hopes of meeting someday, and I’ll enter for your kids if you won’t! Okay then 😉 Would love to meet up! Well! I must enter this giveaway if the winner is to be picked by a couch potato teen! 😀 Maybe I’ll win one in time for our (meager) apple harvest this year. Last year, we had a bumper crop…our trees were crazy loaded, but we went away for 2 months in the fall and missed it all. So sad; I had visions of making enough apple sauce to last us until 2018. This year, the harvest is miniscule, but I still look forward to some pies and general eating. And I think the tree branches here are might break under the weight. Time to come to Colorado, Teresa! I read the first one on a honey-crisp sort of day, Robyn. What kind are you growing? This book looks adorable! And I love how he paints in oils… amazing! You will most certainly enjoy the rich colors, Kim. I want to join in the bonanza giveaway just for the random non-concentrating teen selection!!!! Great interview and i love that skyline spread! There is one random teen whose hair covers the eyes MORE than enough for assurance! Gotta love mouth-watering selections, Cathy! Please drop my name in the hat, I love this, love the trailer. Great interview, and this book looks gorgeous and fun. As you understand color so well, I am sure you’ll like this, Wendy! I love Eddie Hemingway’s work, and he’s a great person to boot. I’d love to win a copy to share with my daughter or her school! Thanks for stopping by, Melissa. 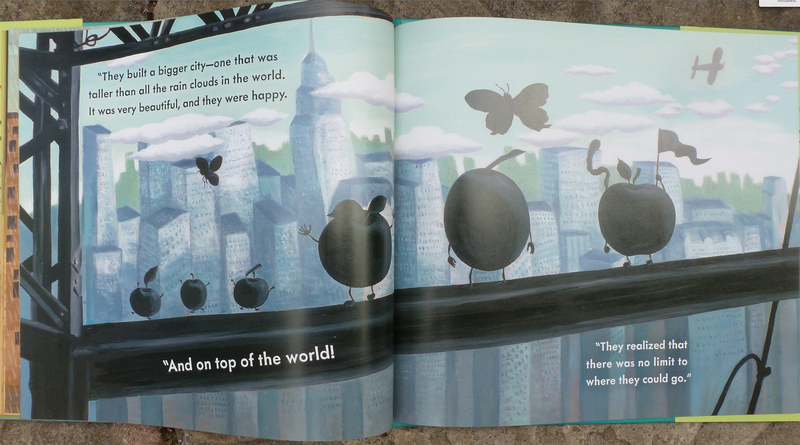 We all love your penguins, but I hope we get to se your birdcopters in a book too – soon! I loved the first one and I can’t wait to read this one! And winning a copy (winner chosen randomly by headphone wearing draw-er) would just be icing on the apple! Great review. Nice interview. Cute trailer! Caramel- or candy icing, Penny? Another great Julie share. I really enjoyed the story and the trailer. The interview with Edward was really interesting. I enjoyed hearing how stories evolved. Glad there was a sequel. Yes, please enter me. Wouldn’t want to upset the cart with a sour one, eh, Patricia? Cathy, I bet you one of those people who take the distance to the library into consideration when choosing a home too! Oh my goodness I think I’m in love! Bad Apple is simply adorable. I need to get my hands on the first one! Isn’t he? Thanks for stopping by for a slice, Sarah! Love, love , love to hear author’s talk about how they get their ideas for stories. 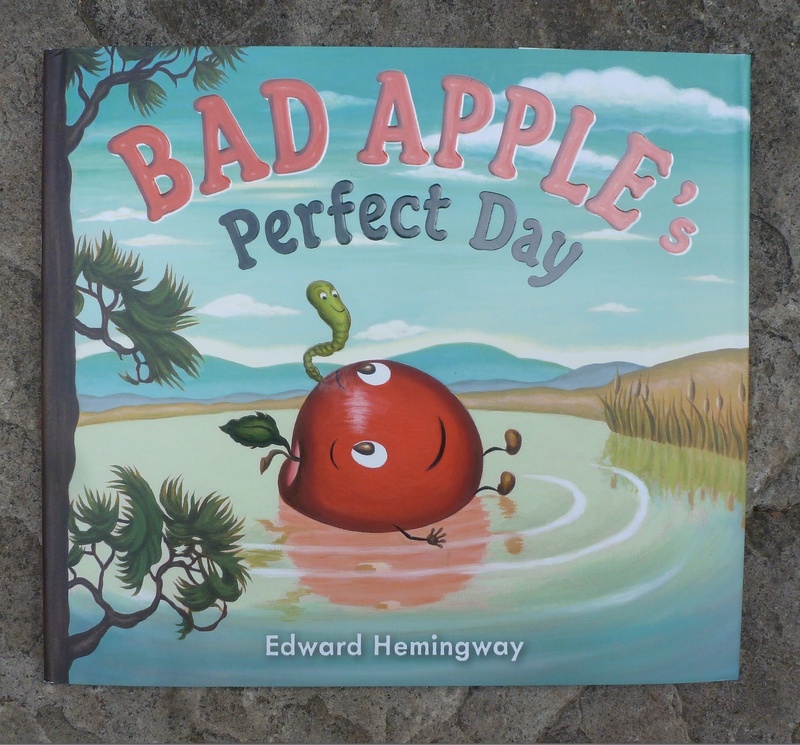 Thanks for the interview and I am looking forward to reading more about Bad Apple. I bet you are a fan of ‘bonus features’ too – like me! The ‘culprit’ was younger then, teen-aging may have mellowed him! Glad you stopped in for a taste, Edna! Sounds like a great book – – so, pick me! pick me!!! Put your wish to the universe, Christine – there is no telling a teen what to do! My favorite part was learning the inspiration for this book. Sometimes it’s the most random, flighty idea that is THE one–as is the case here. I may well ALAWYS be the case, Pat! Soo adorable! Terrific interview, Julie & Edward! Thanks for the kind words, and for stopping by, Lindsay! I like the advice to always be working on “the seeds” of your next project. You can’t put all your “apples” in one basket! This is my first time to your site, Julie. I love it! Great review of a fantastic-looking book. Please enter me in the giveaway: Sandy Perlic. For sure, Sandy! Glad you stopped by. Would love to have a real visit if you’re ever in the Fort! Too adorable! I’ll have to read it to my kids out in our apple orchard. Wish I could read in your orchard too! Love Pink Lady too. Thanks for stopping by, Jilanne. Hi Julie, Did the author paint the 3 giveaway sign for you? This entire post is delightful. I insist you draw my name. What a great looking book. I love the illustrations and your review. Very nice. Pyramids. Rockets. It looks like that bad apple has a pretty adventurous day. Imagination is so affordable too! No, I whipped that sign up (proving bad grammar skills)! Thanks for stopping by! Bad Grammar? Nah, you did a great job. I love the title! And would love to win. Please enter my name to the mix. Entered! Thanks for stopping by, Freeda! YAY … love Bad Apple … didn’t know there was a sequel. Sooooooo excited to add this title to my collections … thanks! Awesome that you got to interview the author! Thanks for popping in, Barbara! GREAT book choice! I already have it and absolutely love it. So glad you shared it! Thanks for introducing me to this wonderful book! I can’t wait to read it, Julie. The fact that the apple’s name is Mac cracks me up. Edward’s advice on “always work on the next project” is great advice! ‘Tis! Thanks for stopping by, Romelle! Sounds like this sequel is as good as the original! And thanks for the wonderful giveaway. 🙂 I was interested to read in the comments that Teresa’s apple harvest was lousy this year, because the NJ one (my mom’s) is too! Inquiring minds want to know why? Hmmm, and the apples are bending the branches here – go figure! You forgot THE GREAT in the middle! My goodness, you’re popular Julie! Here I am, late to the party, and I had to scroll down for half and hour to find the comment box 🙂 What a wonderful book, and how great to hear from Edward himself about how it came to be. And I like Jilanne’s idea of introducing Mac to Pink Lady 🙂 Thanks for sharing this book which is sure to be as great as its sequel! That’s quite the compliment from someone who has such agreat and informative blog herself! Thank you! That word should be a poem title, Lauri! You’ve gotta read the first one to find out for sure! Sheepishly raises hands and waves frantically – pick me! pick me. What a fun beginning for the book. Thanks for the interview and the book. Oops. I forgot to put my name in the comment. Stacy S. Jensen. Ready for my name to be in the drawing. Good luck – for Enzo! I’m coming back to leave my full name. I figured I’m not the only skimmer in our community!